Wake up, Fescue! Wake up! Who called for this late winter chance of snow? I’m angry! Not really. Nature has a way of doing things that I may not agree with, but I’m not one to argue with her. So winter is almost over. What do we do with the fescue lawns now? As previously stated, winter kill is still a a reasonable threat, but soil temperatures are climbing and that means it’s time to get churning. For the first application of the year, you want to make sure the soil has the proper nutrients to supply the fescue with everything it needs to get up and stretch its wings. Nitrogen is atop everyone’s mind for that effect. Nitrogen is a very valuable nutrient. It aids in shoot-root development, desnity, color, disease resistance, and stress tolerance. You know how when you fertilize the lawn, you get that two weeks of incredible growth and color? Thank nitrogen. However, it’s not the end all be all to fertilizer. 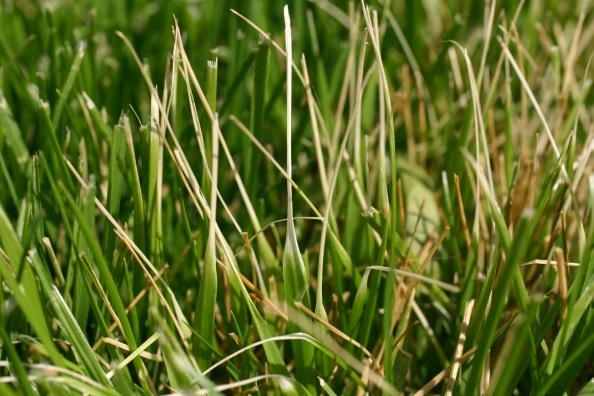 Many nutrients, macro and micro, go into the development and well being of fescue and all turfgrasses. , John Wiley, New York; and F. Salisbury and C. Ross, 1978, Plant Physiology, 2nd edition, Wadsworth Publishing, Belmont, CA. Nitrogen N Component of nucleic acids, amino acids, proteins, chlorophyll, and coenzymes. Affects shoot-root growth, density, color, disease resistance, and stress tolerance. What an overwhelming list of nutrients, right? Not necessarily. Many of them are readily available in the soil. Many are not. This is why soil testing is a valuable tool. Grant it, it’s not the end all be all in diagnosing every possible issue, but it can put you down the right path towards healing. So how does this play into the fescue spring time wake up? Here at Outdoor Designs, we do indeed use nitrogen to perk up the fescue. However, we also pack in there plenty of potassium (to start prepping for the impending summer brown patch) and sulfur. We also use a mix of 5 different chelated micro-nutrients in varying quantities to give turf that extra “screaming green” push right out of the door. Oh and a secret ingredient so simple you’d never believe it. Spring is not the time to hammer the lawn with high rates of fertilizer, that’s actually for fall. But it is time to make a push toward plant maturity to survive the impending stresses of summer. The more mature the plant, the greater the root mass, the better chance of summer stress performance. From here our program makes it’s organic push to make sure there is plenty of organic matter for the beneficial bacteria. Isn’t this exciting? Let us help you wake up your lawn this spring and get it ready for its best year yet!